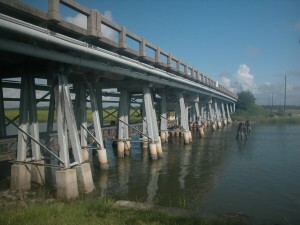 Childs Engineering Corporation was tasked by the U.S. Navy to inspect and design repairs to Bridge 896 at the Marine Recruit Depot, Parris Island, South Carolina. This project was based on a previous inspection performed by Childs which identified several structural deficiencies. As part of the project, Childs personnel performed a design level inspection, prepared a preliminary design report at the 35% level, and designed repairs along with plans and specifications for bidding the project. Recommended repairs included rehabilitation of the steel H-piles and concrete jackets, recoating, concrete spall repair, slope stabilization at the abutments, and catwalk replacement.